Build a screen top for your aquarium on your own with one of our DIY Kits. If you have a rimless tank just simply select the length of your tank for the properly sized screen netting kit. Rimless tanks are becoming more and more common and we all know why they simply just look better. They do require a full-sized net top to span the full length of the aquarium, keeping your fish in the tank. Many people will make their own plastic brackets, magnets, or come up with their own DIY way to suspend the top just inside of the glass of the tank for the best overall look. Innovative Marine has their Auqa Gadget Screen Top Suspension Clips, which work very well with rimless tanks making suspending the top super easy. Rimless kits come with full-length frame sections to span the total length of the tank to create a single screen top. Only 4 corners are needed to complete a rimless screen net top kit. I wanted to make the screen around my overflow but found that to be impossible to keep the screen taunt. The minute you put pressure on the screen to keep it taunt, the pressure pushes the rails in and distorts the shape. This is especially pronounced with a larger size aquarium. I would say stick to rectangle shapes to make this work well. Its lightweight, easy to move about, and very easy to assemble. They gave much More than enough netting and I would gladly recommend this screen top. assembly was easy, components were of good quality, and the finished product looks great. One suggestion is to take your time and you will get a real professional result. Was a little worried that this would be difficult for me to put together (I'm not very handy), but was pleasantly surprised at how easy it was to put together. Used a hack saw to cut the pieces to size. Spline roller made it incredibly easy to make the screen secure. Love the way it looks on my rimless tank. You can't even see it! Hi, is the frame metal or plastic? Thanks. The frame itself is made from aluminum. I have a jbj nano 28 that has a rounded front. is there a way to make this screen with a rounded front. Unfortunately the frame doesn't bend well. What most folks do is make a square/rectangle shaped screen to cover what they can as its better then nothing. I'm dumb, what about an unconventional tank size like a 300DD (6x3) Has 2 cross bracers. So I would be ordering like 3 of the "3 foot" tank sections and then swap width length? (So 3 foot front to back, and 2 feet width which should put the edges over the braces? With 3 sections over your tank you will want 3 of the 3 foot kits. You can cut with a hack saw the frames down to length to work on your tank! Feel free to let us know if you have any further questions! Can this kit be purchased with 1/2" screen top netting? I have a 48" x 12.5" tank, but it's divided in the middle by a support. Would I need to buy 2 2' kits, or will a 4' kit work with the frame supplied? We currently have the 1/8" screen top kit available in rimless (one top kits) and rimmed (which make 2 tops) You will want the 4" rimmed option. I have included the link below! What size is the fame ? If it's prime line it's either 5/16" or 7/16" as I'm considering modifying my cover to go around the return lines and need to get 8 corners . Our frame rails measure 3/4" wide and 5/16" thick. I cannot comment on whether or not our corners will work with your existing frame but they can be modified with a utility knife if they are a close fit. What thickness are the frame sections? 1/4"? 3/8"
This is 5/16" thick from top to bottom. Feel free to let us know if you have any further questions! I just received this kit and put it together. When I did, my measurements were a little off and the screen top does not fit flush on my aquarium. Is there an easy way to take it apart and cut what I need to to make it fit? Or do I have to buy some more materials and start over from scratch? Thanks. You can just pull the spline out pretty easily. Once the spline is out the netting should fall right out. From there the frame can just be pulled out of the corners and trimmed if needed. What's is the best size to buy for a jbj 45 rimless tank? Based on the dimensions I was able to find on that tank, it looks like both sides are under 24". Our 2ft DIY kit includes 4 2ft lengths which can be cut to size, so this should be perfect! What material are the frames made out of. Could I cut 1/2 or 3/4" off segments? They are made out of aluminum. In almost every tank situation your going to have to trim the frames to size. A hacksaw works the best for most folks. How does this stay suspended if it is cut to fit the inside dimensions of the tank? On most tanks you would cut it long enough that it fits on the inside lip of the rim. If you have a rimless tank and you want to cut it smaller then the inside dimension then you would need some sort of bracket or clip. What is the difference between the normal and rimless packages? I only need the 2ft package, but have a rimless tank. Is my only option to buy the 5ft rimless? Hi, would this kit work for a corner bow front? front corners to back tip of corner are both 32 1/2 " ansentire front bow from left to right 36". i dont know how to check the brand of tank. i bought it used as just tank and stand! also!!! will it work with a basking light on it as i am using it as a water dragon set up as i find all my sw supplies. if this kit works, please provide me a direct link to which exactly i need! thanks! Unfortunately the screen top kits are not well suited for corner tanks or bow fronts. The frame is standard window frame and does not bend along with bow of the tank. in addition the screen is not designed to hold elements and a hot basking light would have the potential to melt through the top. Feel free to let us know if you have any further questions! Yes, this can work with rimless tanks. A popular option is the aquarium lid clips in the link below! Would this netting be ok, under Metal halide lighting? Because of the Heat? The netting will work great under metal halide, We currently have several tanks with this netting under MH. Feel free to let us know if you have any further questions! I have a t5 fixture that sits on the frame of the tank on the sides. Will these system be compatible with it? Can I build this screen top so that it sits on the inside of the lip of the tanks rim? Most folks make the frame small enough to fit on the inside lip of the frame, so unless the legs on your light fixture protrude a lot on the inside lip, you should be just fine. There strong enough that if the frame was only supported on the front and back lips you usually wouldn't have any issues either. I just bought this kit. Any suggestions for notching the frame (or ???) so that it can lay flat and have a notch for the power cords leaving the tank? We typically will shape the frame to be a little smaller to allow for cords to leave the back, To notch you may be able to with a hack saw or metal sheers. Feel free to let us know if you have any further questions! I have a plastic rim tank and the top sits down in flush, this makes it hard to get a hold of and lift up for feeding and tank cleaning. Do you have any kind of handle to attach to the frame? We do not currently have a handle solution available. However this may be a DIY project with Super glue and small segment of plastic or acrylic. Feel free to let us know if you have any further questions! Wondering what size to get for an SC Aquarium starfire 50gallon?? I was thinking of the 2feet?? 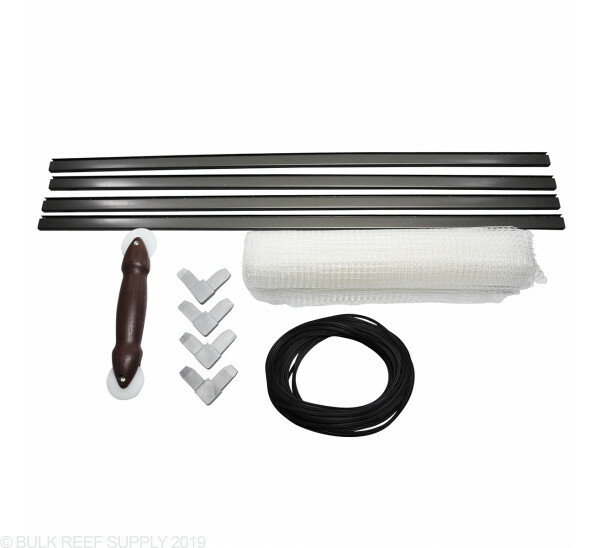 That's difficult to say without knowing the exact footprint of your aquarium, but an easy tip is that the kit includes 2 frame lengths for the short side of the tank, and 2 frame lengths for the long side. Just ensure that the kit you select has pieces that are long enough for both the short side of your tank, as well as the long side, and you'll be fine! What is the Frame con structured out of? Is it metal or plastic? Is it safe to have touching the water? The frame is made from aluminum. It won't rust and water splashing on it/salt spray isn't an issue though I wouldn't suggest actually submerging it. This may be a stupid question but I have a 55 gallon tank. The dimensions are 48 x 13 x 20. I just need to order the 4 foot kit correct? You got it. The 4ft kit comes with frame and netting to cover up to a 4ft x 3ft area. Is the 1/4" spacing of the grid? How will it affect reef light? What's the best way to cut the framing pieces to the fit my tank? Correct, its the grid spacing on the netting. It has a very minimal effect on the amount of light in the tank. The easiest way to cut the framing is with a simple hacksaw. I have bought just the screen in the past. I use it to make custom lids for people with acrylic. Is the mesh on its own still available? You are correct! You cut them down to size so you just want to make sure they are atleast as long as the sides of your tank. What is the best way to cut this? If my tank is a 90 gallon (48.5 inches by 18.5 inches), the 4 foot section covers the length, but too much on the width. Suggestions? A hacksaw works just fine for the screen frame. The netting itself is soft enough to easily be cut by a razor blade.